Article first published as TV Review: SEVEN SECONDS on Seat42F. Netflix’s newest drama is SEVEN SECONDS. Created by Veena Sud, it shares a fair amount of DNA with her previous television series, The Killing. SEVEN SECONDS begins with a car accident involving a young boy on a bicycle, and then tells the story of the investigation and familiar reactions to the incident. Unlike The Killing, however, viewers get to see exactly what happened in the opening, so the mystery is more about what will happen next, rather than what has already happened. Plus, the boy survives, at least the first hour. The cast, as in most modern shows, is excellent. Regina King (American Crime) and Russell Hornsby (Grimm) play Latrice and Isaiah Butler, the grieving parents who don’t know the truth about what happened, and are not thrilled with the legal system in place. Clare-Hope Ashitey (Suspects) is KJ Harper, the alcoholic prosecutor who looks into the boy’s case. She is assisted by cop Joe Rinaldi (Michael Mosley, Sirens). Though this won’t be an easy one to solve, since it’s another cop, Mike Diangelo (David Lyons, Revolution), doing the covering up. Why would a cop do such a thing? Well, the offender is another on the force, Peter Jablonski (Beau Knapp, Shots Fired), Mike’s friend who is expecting a child soon. Even Peter thinks he should confess, so the whole force isn’t villainized in SEVEN SECONDS. But the societal pressures of previous violent assaults by white cops on black kids, which the victim is, are all the reason Mike needs to think Peter would be in much deeper trouble than he deserves, and prompt him to frame someone else for the crime. Though by the end of hour one, Peter and Mike now both deserve pretty bad. This makes for a timely, complex tale, which all the best shows are these days. Like a lot of other television programs, this one is about crime and police officers. And like most others, the cast is good. So SEVEN SECONDS is great, right? Well, not exactly. The biggest problem SEVEN SECONDS has going for it is that it is boring and slow. I like slow when the characters and tone are super compelling and the camera lingers to really delve into emotion. In this case, nothing much happens, but it’s not because the running time is dwelling on the characters. For instance, a portion of the first hour finds KJ and Joe filing some paperwork and visiting the hospital and impound lot. None of this furthers anything, nor are there long, insightful moments between them. They’re just there. I think it also probably hurts that we know who the guilty party is. I mean, mystery can be overdone or melodramatic, but at least there’s a strong hook as viewers try to figure out what happened and the implications of it. Instead, here it’s pretty safe to assume the truth will come to light, so the only suspense is how. We already know the fallout will be bad, we just don’t know how bad. So there’re not enough stakes, nothing to truly wonder about. There is a fake-out about the victim’s identity early on, but it doesn’t go anywhere. And, bottom line, none of the characters are compelling enough. I get Peter’s conflict, but it’s hard to root for him when he did something so heinous, even as he considers stepping forward. Of course, it’s easy to sympathize with the parents, but at least in the first hour, we don’t learn all that much about them. The cops are even less interesting. 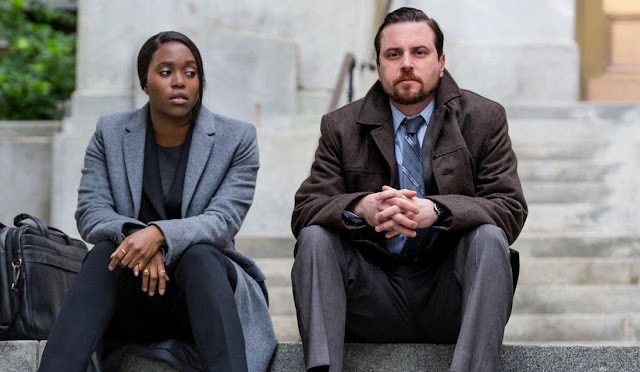 SEVEN SECONDS seems to prove, as a few other shows have recently, that sometimes a series just isn’t as good as the sum of its parts. The first season of SEVEN SECONDS is available now on Netflix.